Colorado’s Stephen Petty, MD, received the prestigious Outstanding Humanitarian Award from the American Academy of Ophthalmology in November in recognition of his years of service for the underserved around the world. 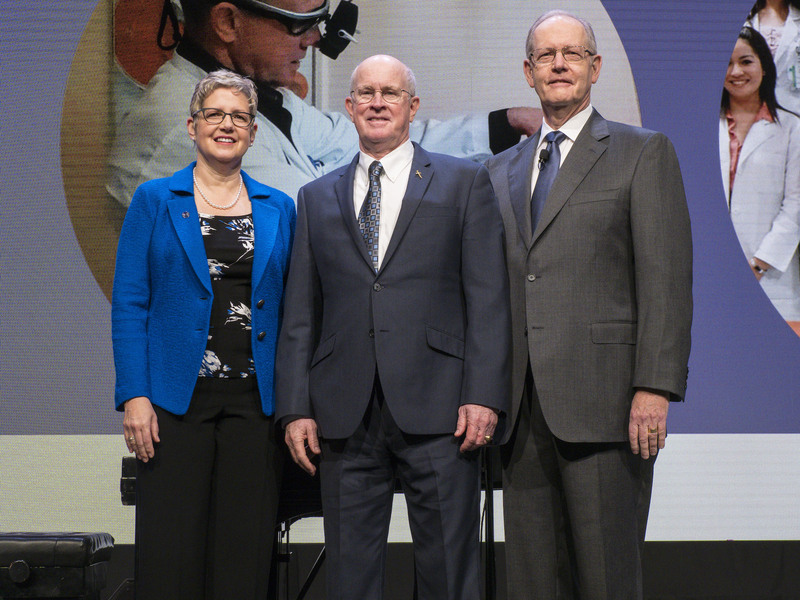 Stephen Petty, MD, (center) is awarded the 2017 AAO Outstanding Humanitarian Award by AAO President Cynthia Bradford, MD, (left) and AAO CEO David W. Parke, II, MD. CSEPS and ophthalmologists across the state celebrate Dr. Petty’s leadership, service and example to the rest of the profession. What started as a first year of medical school trip to Tijuana, Mexico, turned into a life’s calling of more than 100 trips across the globe. Over the span of 40 years Dr. Petty brought sight-saving vitreoretinal surgery to places where it did not previously exist and trained ophthalmologists from South America to Africa to Asia. In addition to direct care and provider training, Dr. Petty has also raised hundreds of thousands of dollars in support of these mission trips. Read CSEPS President Dr. Alan Kimura’s full nomination of Dr. Petty here. Congratulations Dr. Petty and thank you for being such a shining example of the profession.